Main House: 2 Kings, 1 Queen & 2 Twin Beds. Guest House: 2 Twins that can be made into a King Bed. 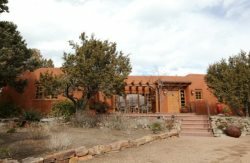 Casa Las Artes, located in Tesuque, New Mexico, is a single family residence occupying approximately 6,000 square feet in a private gated compound. This exceptional home includes a main house with four bedrooms that sleeps eight and a casita with an additional bedroom that sleeps two more. Located in Tesuque Village, just minutes from downtown Santa Fe, this private destination rests under 200 year old cottonwood trees. It has been recently renovated with all new furnishings, appliances, and art in an elegant southwestern style. Casa Las Artes consists of four bedrooms in the main house and one in the casita, sleeping eight comfortably. In the main house, the master bedroom has a king bed; the second master suite has a king bed as well, and one of the other bedrooms has a queen bed. The remaining bedroom in the main house features twin beds that can be made into a king bed and the bedroom in the casita feature twin beds. The spacious master suite consists of a sitting area with fireplace, a large walk in closet, a large bathroom with two vanities, bathtub and separate shower, plus a terrace overlooking the landscaped grounds. There are five and one-half elegant bathrooms; one for each bedroom in addition to a powder room off the entryway. Hair dryers and laundered bathrobes are provided for your use. There are two complete kitchens in the main house as well as a kitchen in the casita which is superb for entertaining. This allows for great flexibility of use by friends and family. There are outdoor entertaining areas, including one with a new stainless steel grill. There is a security gate with keypad entrance, and also a security system including fire alarm in both the main house and the casita. The house and casita contain five fireplaces including one newly-constructed on the outside patio of the main house for those chilly nights. Casa las Artes consists of a main house with two master suites and two additional bedrooms, all of which have their own private baths. They are furnished with the most exquisite bedding and towels from Ralph Lauren and Peacock Alley. The kitchen was recently renovated to include all new Jen-Air appliances, a wine cooler, Calphalon cookware, Cuisinart small appliances and Vietri pottery. Throughout the house there is new carpeting, flatware, china and glassware. The casita has an additional bedroom, kitchen and separate washer and dryer. The furnishings truly reflect a Southwestern home with artwork by Native American artist Nocona Burgess, as well as pieces by Henri Matisse, David Rothermel, Anthony Chee Emerson, and Willard Clark. One will also find folk art from great Mexican masters, including Irma Blanco and Neftali Ayungua Suarez. The house is furnished with Peruvian folk art, fabrics and pottery, baskets from Indonesia and Venezuela, Mata Ortiz pottery from Mexico, black pottery from Oaxaca, Hopi Kachina, Navajo rugs and baskets, antique Mexican furniture, Native American pottery and Tibetan rugs. Throughout the house and casita are Sony high definition televisions, LG DVD players and high speed wireless internet. The main house includes two sets of washers and dryers, two separate kitchens, four fireplaces, one balcony off the master bedroom, and five patios or portals for relaxation. An outdoor fireplace with seating and dining areas surrounded by large cottonwood trees, fruit trees, Russian sage, lavender and wildflowers has been newly-constructed. The house is truly a reflection of Southwest America! Santa Fe and Tesuque offers shopping, restaurants, live theater, museums, art galleries, opera, skiing, snowboarding, hiking, bicycling, fishing, rafting, kayaking and touring of nearby Native American Pueblos and ancient ruins. Taos, Albuquerque and other historical sites are also nearby. During the holiday season the casita rents for $100 more a night. Special Note: Stairs and Steps; Stair well, Steps to Living Room and Steps to lower level bedrooms. Kind and willing to help. Loved it, made marvelous memories. I was very pleased with the professionalism and completeness of communication with your company. I would definitely rent from you again and I have already recommended your company to friends. My family critiqued the stay/visit and thought it was great. They even told me that if I was asked to evaluate the property I should tell you how wonderful it was. I even thought I would email the owner and tell them how we enjoyed their house! Thank-you! I appreciated your follow through and information you provide prior to our visit. We had a wonderful time in part due to you! This property was amazing. We met several locals who were intrigued by the house we were renting, how we found it and the quality that we told them about. Imagine 9 adults walking into the house and having a jaw dropping experience. We actually stayed in more evenings and didn't go out for dinner because we wanted to be at the house and use every piece of it. With that said here are a few items that we noted through the week that you may want to look into. 1. There was no key for the front gate of the property (by the street). Gate was held closed by a rock. Some locals in the same development expressed frustration around that as well. 2. The door knob for each of the king rooms was loose/only appears to end a new knob unit. 3. There was 1 track light out in the kitchen. 4. Dead batteries in most remotes on tv's, mirror lights in some bedrooms. 5. One coffee pot provided had a crack in it, we threw it away. We still had a pot to use for coffee. 6. Dishwasher- we had to run it at least 2 times per wash as dishes were not clean- visible food in dishwasher and on dishes- this is the main kitchen area. It appears the detergent bar never dissolved. 7. On our last day the kitchen faucet head came off- we were able to replace/ fix it but you may want to check this. 8. A spring is missing on the toilet paper holder in the 2nd floor queen bedroom. I want to state again that none of the above was a deterrent to our stay- just items we thought you might want to check/ fix. Thank you for an amazing vacation rental home!! Please feel free to call me for anymore information!